For a larger sized image, click on the thumbnail image. Close the window that opens to return to this page. 2nd Lieutenant Raymund Louis BINNS. 8th Battalion Yorkshire Regiment. Son of Dr. William Binns and Mrs. Binns, of The Cedars, East Bergholt, Suffolk. Educated Stonyhurst College, Lancs. Married 1913 Maud only daughter of the late Rev. J. and Mrs. Cartman, of Bonby Vicarage, Hull. Killed 10 July 1916. Aged 32. Raymond Binns was born on March 21st 1884 at Ipswich in Suffolk. He entered Stonyhurst College in 1897 and quickly showed his talents as an artist and in the sporting field excelling at swimming and hockey. Leaving college he soon made a name for himself with his designs and letterings. In 1913 he married Miss Maud Cartman of Hull. At the outbreak of war he is quoted as saying “I feel the times call for something heroic”. He enlisted into the Inns of Court Officer Training Corps on January 29th 1915 and was commissioned with the Yorkshires in April of 1915. 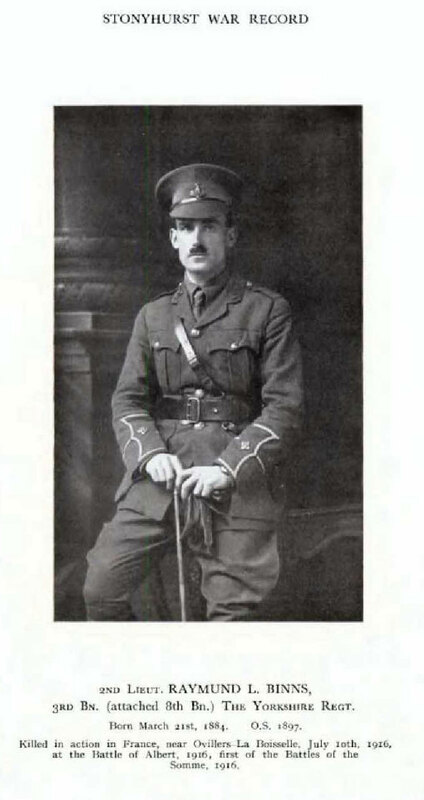 In May of 1916 2nd Lt Binns joined with the 8th Battalion in France, first serving in the Angres sector. The battalion then moved down for the forthcoming Somme offensive on June 24th 1916. On July 5th the battalion took part in the action at Horseshoe Trench and on July 10th they assaulted the village of Contalmaison. 2nd Lt Raymond Louis Binns was killed in this action on July 10th 1916 dying instantly from a bullet through the head at the age of 32 as he led a party of bombers forward. Raymond Binns was the son of Dr William Binns of The Cedars, East Bergholt, Suffolk. The photo has been taken from "Stonyhurst War Record" . We are very grateful for Stonyhurst College for allowing us to use this photo. The entry in the "Stonyhurst War Record" for 2nd Lieutenant Binns may be seen by selecting the link to the PDF file below.